I find myself irritated at people who skip through Holy Week in their rush to Easter, and those who participate in Holy Week while talking about how Sunday is coming. I don’t like seeing “He Is Risen!” proclaimed on church signs or Easter hymns on Palm Sunday or pictures of the stone rolled away from the tomb on Holy Saturday. Even though I know how the story will end, these little gestures still irk me the same way someone revealing spoilers to an episode I have yet to see does. 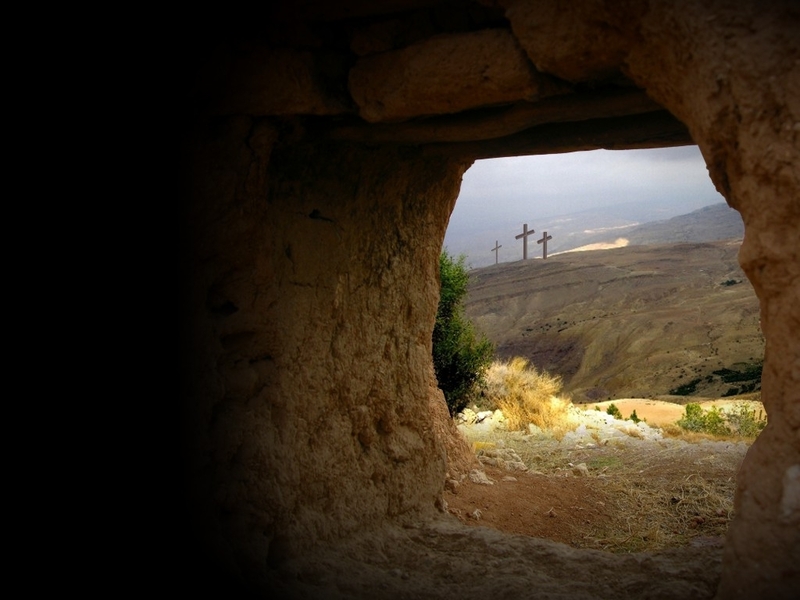 But it’s Holy Saturday, and I have a picture of the open tomb a day early. And when I woke up on Good Friday morning, I emotionally skipped ahead to Sunday. I felt well-rested after a week working a Girl Scout day camp, and the day was sunny and gorgeous. I spent the day with Bryce, grabbing lunch together at Sheetz (because we like “good” fast food”), dropping the car off to get a tire alignment, and going for a long walk in the Northern Virginia area before heading home to relax and play video games/read comics for the rest of the evening. I did this instead of attending a Good Friday service, a first in 4 years, because I my soul wasn’t in a mourning, uncertain period. Instead, it was full of joy and more relaxed and content than it has felt in a long time, and I needed to honor that. When you struggle with anxiety on a daily basis, you’re no stranger to fear, despair, uncertainty, and even devastation. For many of us, Good Fridays happen weekly or, for stretches of time, even daily. So when Good Friday came, but my mind was content and resting in Easter, I knew better than to disrupt it. Instead, I let it be. I didn’t mourn. I didn’t think about the fear and death I, or even we as a nation and as humanity, experience on a daily basis. Instead, I let Easter arrive a little early for me. I let my soul rejoice in this resurrection taking place within me, from a new job and a steady income, as well as renewed vigor in productivity and relationships. I let myself lay my burdens down, walk lighter and taller, and simply rest in the peace surrounding me. Some may ask how I can celebrate Easter if I haven’t stopped by the death and uncertainty of Good Friday. But I can say that after enduring days, weeks, and even months of Good Fridays, the joy of resurrection is still very much real to me, even if it arrived a few days earlier this Holy Week. I remember where I was last Good Friday. I was kneeling at the foot of a black-shrouded cross at Community Mennonite Church in Harrisonburg, tears streaming down my face, internally pleading to God to stop the onslaught of intrusive thoughts in my mind. I was on a medication that wasn’t working, but I was too afraid to stop it lest the thoughts grow worse. I was barely in control of my mind most days, since paranoia and restless thoughts streamed through it day and night with few interludes. I remember spring bursting with new life all around me that year, but I hardly noticed. I could only focus on the pain and turmoil wrestling within me. Good Friday and Holy Saturday were so real in their pain, despair, and uncertainty that year, and I needed them more than I ever have in my life. They met me where I was. This year, though, I have seen the newness of spring from the beginning. I notice trees blooming, flowers bursting forth from the ground, the grass growing greener, and the chirping of birds. I notice them this year, because my mind is in a good place to allow new life in instead of being bombarded by anxious thoughts. This year, I’ve learned to cling to the days of Easter when the Good Fridays ebb out. I’ve learned to hold onto the rejuvenation of the Easter days in order to have the strength to carry on for the next wave of Good Fridays. So this year, I did not participate in Good Friday. My mind and soul woke up to Easter, and I let them stay there. And that was OK. In fact, it was necessary. It didn’t mean I copped out of the story, nor did it mean I said death and despair are too big, scary, and difficult for me to handle. It meant I know the journey as a person with anxiety is already full of overwhelming Good Fridays, and when the breaks come, it is in the best interest of myself, my loved ones, my work, and my faith to take advantage of them. So if you struggle with mental illness, enjoy your Easters when the Good Fridays are finally over. If you remain in Good Friday and Holy Saturday when Easter arrives, don’t rush into a resurrection you’re not ready to experience. Wherever you are, this Holy Week and those to come, let yourself be there. This story proves God has been through death, despair, and resurrection, and just as God did not rush through those, God will not rush you through to the end. Be where you are, and know God is there with you.